The first Master Chief figure in the Halo franchise came with the M6D pistol, MA5B Assault rifle, and my personal favorite, the S2 AM Sniper Rifle. There are 14 points of articulation, making it a whole lot of fun. You can pose the Chief in almost any way. Some of these packages came with a mail-in card (seen behind Chief) which are harder to find than packages without the card. 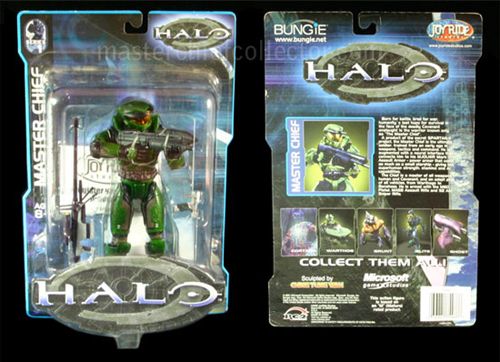 In 2003, Joyride Studios made the Halo: Combat Evolved Action Figures. There were five series of the large action figures. On each figure, Joyride put a serial number that shows when the Action Figure was created. The date code has four numbers followed by ‘SS’ stamped or embossed in the cardboard. The first three digits are the day of the year that the figure was produced, and the fourth digit is the year. For example: 2653SS means the product was manufactured on the 265th day of 2003 (9/23/2003).